Closing Costs – What are they, and who pays for them? In short, there are two bigger categories of closing costs – Buyer related, and Seller related. These are the costs associated with the purchasing, lending, and/or selling of a home. Depending on the lender, title company, and financing type, these costs may vary. Before we tackle what these are, let’s first look at it from a Seller’s perspective. Not all Buyers can afford their own closing costs. In fact, this is pretty common. It is, however, person-to-person dependent, and is less common in a price range of over $450,000. The reason for this is because individuals who qualify for a larger home loan typically make and/or have more money in general. A buyer can ask a seller to pay a portion, or all of their closing costs. The amount a Seller can legally pay towards a Buyer’s closing costs will vary depending on loan type. For example, with an investment property or vacation home (non-owner occupy / not a Buyer’s primary residence), a seller can only pay up to 2% of the buyer’s closing costs. Contrastingly, on something like a FHA or VA Loan, a Seller can pay up to 6% and 4% respectively (there are some caveats to this, too long to list). This is because lenders know that compared to investors or second-home buyers, first time homebuyers typically have less money lying around and may need a little extra help. · Miscellaneous Fees – Escrow fee, Attorney Doc Prep Fee, Surveys, Recording Fees, Title Transfer Fees, Tax Registration Fee, Appraisal Fee. What is the seller paying for on their end of the deal? The actual fees for the Seller to close a on a home are much less in contrast. This is because they are not using a loan or financing any portion. Also, this is one of the main reason cash deals are so enticing – there are far less costs associated with them. In closing (see what I did there? ), I’ll leave a quick note to Mr. & Mrs. Seller – if you’re selling a home under about $450,000, the buyer may or may not have funds for their closing costs in addition to their down payment. It may be wise to consider this fact before listing, and not feel blind sided if you get an offer with 3% of the prospective buyer’s closing costs tacked on at the end. There you go! Those are the basics of closing costs! 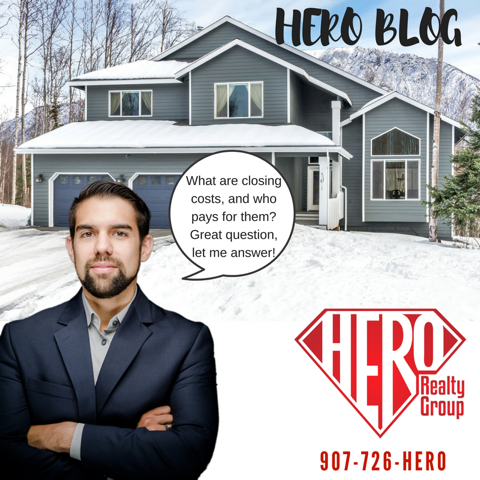 E-mail James Cash at james@herorealtygroup.com, OR, call or text us at 907-726-HERO.